Bonfire Night, Fireworks Night, formerly Gunpowder Treason Day, or as most Americans know it, Guy Fawkes Day / Night is an annual event in the UK (United Kingdom). The bonfires and fireworks that are put on mark and celebrate the events of 5 November 1605. On that particular night, Guy Fawkes, member of the Gunpowder Plot (which formed in May 1604), attempted to blow up Parliament, in particular the House of Lords (upper house of the Parliament, made up of those of noble birth, aka Lords). Fawkes was a Catholic who was attempting to assassinate King James I with 36 barrels of explosives strategically placed under the House of Lords. Of course, his plans were foiled as he was discovered the night before. Interestingly, Fawkes was not the ring leader of the Gunpowder Plot; that honor goes to Robert Catesby, but Fawkes' part on the plot is what has given him the long standing notoriety. Illustration of the Gunpowder Plot members, include Catesby and Fawkes. Fawkes, under the name John Johnson worked as a caretaker of a cellar located directly below the House of Lords. The men of the Gunpowder Plot rented the cellar to stockpile gunpowder and explosives. According to the plan, Fawkes would light the fuse during the opening of a new session of Parliament on November 5th. They had plans for their escapes, plus a plan to kidnap King James' daughter Elizabeth (not Elizabeth I - she came before James) and force her to marry a Catholic. It was all about restoring a Catholic monarchy. Of course, on October 26, someone (an anonymous source - identity still a mystery) tried to warn a Catholic sympathizer to skip the opening session, who in turn alerted the police. Fawkes was first tortured at the Tower of London for his treason, four of the members (including Catesby) died in a shootout, and the rest of the members were arrested. Fawkes and the arrested members were found guilty of treason and in January 1606 were hanged, drawn, and quartered. The actions of the Gunpowder Plot, in turn, led to restrictions on all Catholics in under British rule: they could no longer vote or serve in the military (laws that stayed in place until the 19th century). On December 9, 2014, the earliest piece of writing about the Gunpowder Plot is going up for auction. It was written only four day after Fawkes' arrest. Londoners quickly began starting bonfires to celebrate the failed attempt of their King's life. Shortly after Parliament publicly made November 5th a day of thanksgiving, a holiday if you will (it was temporarily celebrated in America under the name Pope Day). In the UK, the anti-catholic tone was replaced with a night to enjoy fireworks, bonfires, torching effigies of Guy Fawkes (and now other famous types), along, of course with drinking. Of course, Guy Fawkes' legacy expands beyond a traitor to rebel hero these days. Guy Fawkes masks are used by the group Anonymous and Alan Moore gave him new life in the graphic novel V for Vendetta (which I try to read every November 5th). In these circles, V is a hero celebrated for his acts of rebellion against a fascist oligarchy. 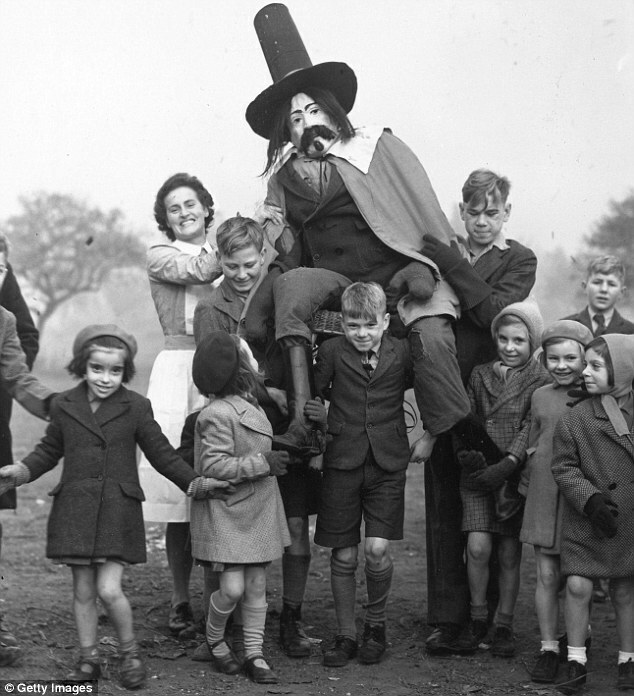 I selected a group of vintage photographs featuring children with their effigies of Guy Fawkes; a little creepy, but no different than vintage Halloween photographs. Also, if you enjoyed the opening archival Bonfire Night footage from Pathe, check out more of their Guy Fawkes Night videos on Youtube.